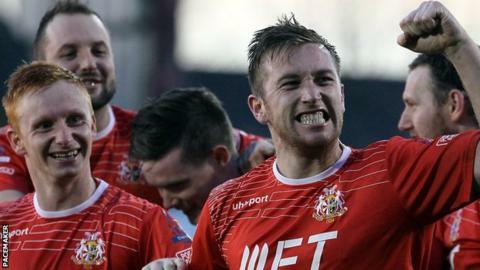 Portadown are top of the Premiership on goal difference thanks to an exciting win over Glenavon at Shamrock Park. Ronnie Fall's side led 2-0 through a Chris Casement penalty and a close-range goal by Sean Mackle. Glenavon defender Rhys Marshall fired in from just a couple of yards out but Mark McAllister scored early in the second half to put the Ports 3-1 up. Eoin Bradley scored Glenavon's second while Portadown's Keith O'Hara was sent-off late in the game. The Ports skipper was shown a straight red for a high challenge on Glenavon midfielder Ciaran Martyn right on the edge of the penalty area. However, Portadown saw out the game and are ahead on goal difference from Cliftonville who lost 4-1 at Crusaders. "It is nice to be top, but we are not stupid. There are four or five teams who can challenge for the title," said Portadown defender Casement. "We knew it was not going to be easy and made life hard for ourselves when Eoin Bradley got a goal back for them. "But we defended well as a team in the last 15 minutes and were able to hold on." It was former Linfield man Casement who blasted in a 25th-minute penalty after James Singleton had fouled Gary Twigg in the goalmouth. Mackle made it 2-0 by slotting home after keeper Alan Blayney had failed to hold a Twigg shot. Glenavon got back into it when Marshall fired into the roof of the net but the Ports restored their two-goal advantage in the 49th minute through McAllister who pounced from close-range after Blayney had dropped a Ross Redman corner. Bradley drilled in a low shot from the edge of the box to make it 3-2 but Portadown survived late pressure to secure the victory.